The approach cutting to the east portal is spanned by a brick-arched bridge carrying a farm track. 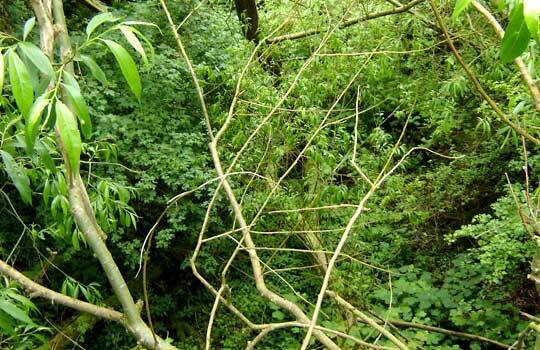 The trackbed is a jungle, with mature trees reaching up around 35 feet to parapet level. Steep rocky walls make a descent impossible from here without rope ladders! It reminds me of Strines Cutting on the southern approach to Queensbury. I expect that this bridge looks quite dramatic from below, if a clear view could be found. 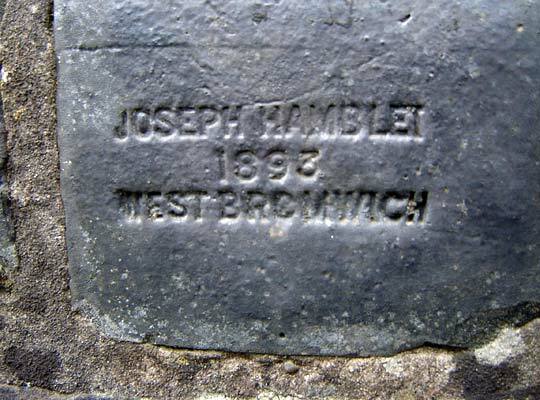 A stone insert dates construction of the farm track bridge to 1893 or later. The farm track bridge is to the right of the pylon and the tunnel portal is in the trees on the far left. The portal is at the end of the hedge on the right. The interesting feature here is on the left - Gang Lane - so-called because of the 'gangers' encampment here during construction of the railway. Looking down into the approach cutting, part of a concrete cap is visible to the eye (but unfortunately not the camera) together with large amounts of mossy overgrowth resembling flowstone and an evil looking swamp in front of the old portal. 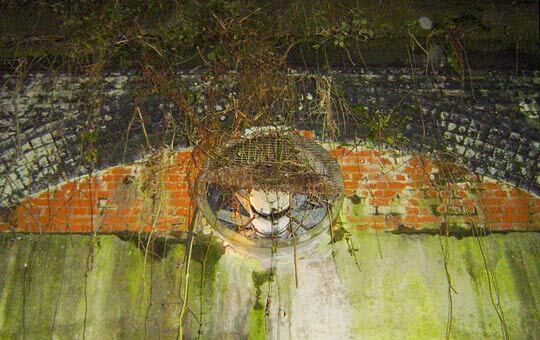 Bolsover Tunnel's eastern portal includes a now non-functional fan. It is impossible to approach any closer without skidding down the steep slope and plummeting into the lagoon! The sound of a nearby lawnmower reminds visitors that suburban civilisation lives cheek by jowl with the carcass of this industrial Leviathan. With the Scarcliffe portal behind me, I am looking over land along the exact axis of the tunnel up to the Scarcliffe main road. 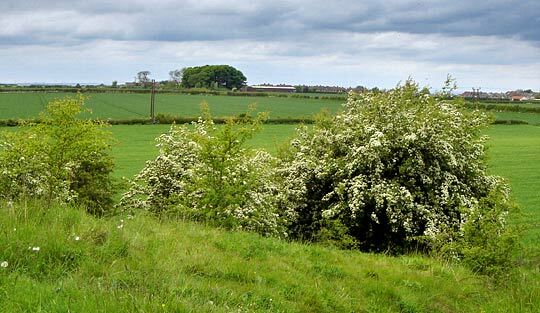 This is the view from on top of the spoil heap by the eastern ventilation shaft (one of two), looking over to the clump of trees in which the western shaft hides. This divides the tunnel into three approximately-equal sections, giving some idea of its length. A surprising find. 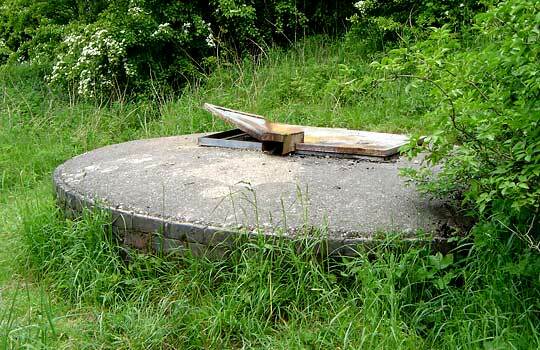 This is the eastern ventilation shaft with its concrete cap and a steel door. Some curious local youths have prised up a corner of the door to reveal a 6 inch hole in the cap. With your ear to the hole, you can hear the distinctive sound of water cascading away into unknown depths. Bolsover still has a watery afterlife! 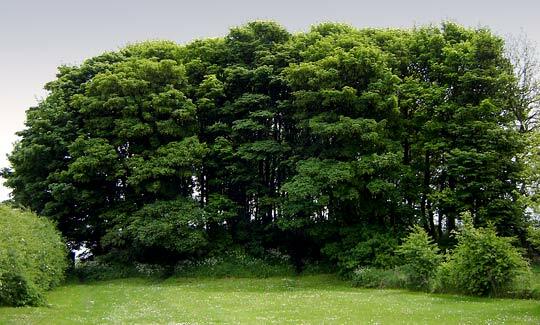 This is the impressive copse of trees marking the spoil heap over the western shaft near Hills Town. The western end has been documented. I wanted to explore the mysterious east end. It is a very interesting walk linking two geo-social facets of Derbyshire, either side of the impressive limestone ridge. Posh Scarcliffe; rundown but gritty Hills Town and Bolsover. You could imagine a D H Lawrence plot between the two places!